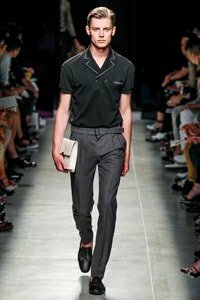 Milan Men’s Fashion Week Spring/Summer 2014: Sporty Spice? As I was chomping at the bit for men’s fashion week to start in Milan, I briefly distracted myself by stopping by the opening of my fabulously stylish friend Caroline Cohen‘s art opening a few days ago at the lovely BoaSoa Gallery just off Melrose in WeHo. After I got over how stunning she looked in her shimmering gold Hervé Leger bandage dress, I noticed some impressive large canvases lining the feature wall. Each piece is a mixture of paint and collage and most paintings reference the peculiar mood a particular location like Paris or Bali. There is enough layering and detail that you’d probably notice something new each time you look at one of them. 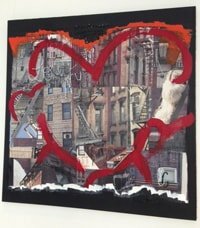 This is the self-taught artist’s first show but there is a level of maturity that surprised me. I can’t wait to see what she does next. Now, let’s check in on Milan and what those damn Italians expect us to be wearing next spring. When ancient Greek-themed prints of Zeus and Apollo started showing up on the clothes, I thought Messrs. Dolce and Gabbana had changed course and set off to foreign lands for this collection, until I found out they were referencing some part of Italy that had been under Greek rule for centuries. Looks like they managed to drag Sicily in again after all. I’ll have to give the Victorian circus strongman beach looks a miss, but the tailoring was lovely when it wasn’t too skintight. Shimmering fabrics appeared in gold, brown, red and pale blue but worked best in silvery white. Later in the day, Stefano Pilati also did a bit of white-on-white tailoring in his first Ermenegildo Zegna collection but the main mood was easy fitting separates in dark blues, grays and neutrals. The interest here lay in two button jackets with overlapping lapels that weren’t quite double breasted—let’s call them one-and-a-half breasted—and in loosely belted jackets and outerwear. Jil Sander was the first I saw to embrace the full-on sport trend in next spring’s sportswear. Everything was super clean, as expected, but the oversized tailored Bermuda shorts were a little extreme, especially given how slim our clothes have become the past seasons. There were some nice deconstructed jackets and skinny-ish cropped pants and pairing khaki with white with pops of orange kept everything looking light. There was more orange at that evening’s Versace show but it was more of the 80s day-glo variety that appeared in knits and was included among the colored plastic strips that were plastered on many of the hunky models. The strong shouldered suiting and abundance of soft leather was typical Versace — I still wouldn’t wear it if you gave it to me but I wouldn’t mind having a pair of the paint-splattered white jeans to throw on with a t-shirt. At the other end of the taste spectrum, Sunday morning’s Bottega Veneta show brought us lots of luxurious tropical wool suiting in shades of gray and black. The lines were classic despite whimsical chalking detail that mimicked seams and lapels. Only a couple of suede jackets appeared in jewel tones but what this collection lacked in color, it more than made up for in desirability. The Salvatore Ferragamo show then took us back to the sport element, even to the extreme of big basketball shorts and huge numbers inspired by athletic jerseys on the shirts. Blue or orange and grass green over white would make these les plus chics uniforms of any team I’ve even seen. I wish I could say the same of Prada‘s collection of slouchy pants and shapeless tops. Cranberry, teal, khaki and brown make an unlikely spring palette, but it made sense given Mrs. P’s depressing inspiration of the tropics during wartime. That’s too bad, because I had wanted nearly every single nerdy look from the fall show. 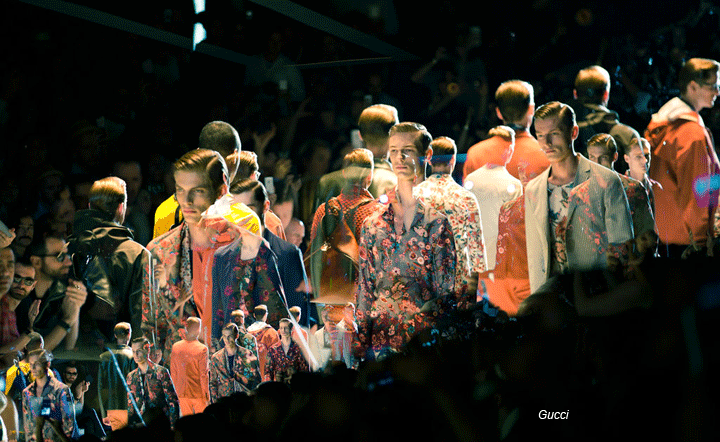 Monday’s Gucci show confused me at first with the all-over Jacobean floral prints and sporty techno fabrics but all the pale khaki, the cool riding breeches-inspired pants and pops of Wedgewood blue and salmon left me enchanted by the end. And all those flower-covered pieces were great, of course, but you wouldn’t wear them together unless you were blind. I was less convinced about Etro‘s foray into Mexican cowboy territory, however. It was a big, ambitious collection and some of the pieces like the tougher riding pants and western style blazers were pretty cool but it didn’t quite do it for me. I don’t know, maybe the enormous leather sombreros threw me. Then Fendi took us back to sports land where looser, deconstructed jackets and outerwear or narrow pants and big shorts were beginning to become a recurring theme. The impressive thing here was the choice of more saturated color in indigo, mustard and burnt orange where so many others are going light. Milan’s few days in the fashion spotlight ended yesterday with two collections that couldn’t have been more different. Dean and Dan Caten’s collection for DSquared2 didn’t offer much that was new but their shows are always fun. Their signature offering of distressed denim and schoolboy jackets styled with biker boots and leather caps started off with a guy in his underwear showering under a waterfall in a tropical paradise. The Giorgio Armani show, on the other hand, was in the same Armani Theatre it always is and opened with indigo and continued pastels of blue, pink and peach in deconstructed jackets and other expected Armani silhouettes. Though predictable, the mood was sportier than usual and finished off even the most staid navy suits with two-toned spectators. All in all, some clear trends emerged: very sporty sportswear; lots of white and ivory; wide Bermuda shorts; and some large-scale floral prints. Let’s see what we find in Paris!